Mastic Tree, known by its scientific name, Pistacia lentiscus, is an evergreen shrub with both male and female parts. It is a sturdy plant, growing in rocky and salty areas usually near coastlines. It typically grows between one and five meters high (three to fifteen feet) and is indigenous to Greece and the Mediterranean region, including Israel, the Iberian peninsula and Morocco. However, its range extends all the way from southern France to the Middle East, particularly Iraq and Iran. In fact, Mastic is found throughout Israel and its use has even been documented in the Bible as the “Balm of Gilead” in Jeremiah 8:22. 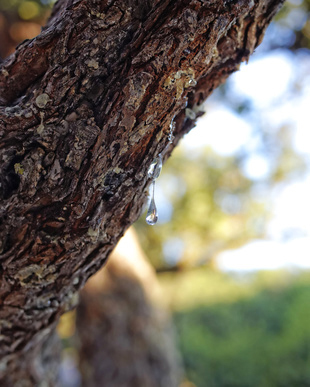 The chief product of mastic is its resin which is usually cultivated by scoring the bark of the Mastic Tree and allowing the sap to exude from it and fall to the ground which has been set up to gather all the sap drippings. A resin develops from the sap and the resin has many culinary uses, but its greatest benefits are clearly medicinal. The mastic resin has been used to treat gastrointestinal problems for thousands of years in the Mediterranean region. It is also known to lower cholesterol, ease high blood pressure thereby reducing the risk of heart attacks. Mastic also has dermatological benefits given that its oil has anti-fungal and anti-bacterial properties, which is why it is often used in ointments. One study has shown that Mastic oil can reduce oral bacterial plaque by nearly half while another study claims that Mastic oil can heal peptic ulcers by killing the bacterium Helicobacter pylori that causes peptic ulcers in addition to gastritis and duodenitis. Mastic resin becomes a gum when chewed that is white and opaque in appearance. Its flavor is bitter, but after have been chewed its flavor becomes reminiscent of pine and cedar and is refreshing. Mastic tree also has many culinary uses. As a spice in Greece, it provides a flavor for liquors and for pastries, cakes and other deserts. It is also used in cheeses and ice creams and puddings in Turkey. It is used to flavor meats and other dishes in Lebanon and Egypt, and in Morocco, the resin’s smoke is used to flavor water. The plant’s leaves are steam distilled to produce the Mastic essential oil, called Lentisk. The essential oil is clear and its viscosity allows it to be poured easily. The essential oil’s uses are antispasmodic, astringent, diuretic, antimicrobial, antiseptic and as an expectorant. And, perhaps unique to mastic tree essential oil, in a study conducted last year and available in the International Journal of Industrial Crops and Products at Elsevier.com, mastic tree essential oil has been shown to have a repellent effect against three major pests that are known to provide a ruinous effect on pasta, when stored, which has a shelf life of two to three years. According to the study, about 13.6 million tons of pasta is produced every year with Italy as the main pasta producer. So, simply from an economic perspective, this is particularly very helpful to Italy since mastic tree’s essential oil can help save that country approximately 4.6 million Euro. Similarly, in a study conducted at the University of Malmoud Mammeri in Algeria, the essential oil of Pistacia lentiscus was also shown to help preserve the shelf-life of strawberries. In another study completed in 2008 and accepted in 2009, Pistacia lentiscus oil hydrodistilled from plants found in eastern Morocco were found to have quantitative and qualitative differences with Pistacia lentiscus plants indigenous to other countries. Obviously, mastic tree essential oil has multiple uses as a food and food protector as well as various medicinal uses, which serves to state loudly and, perhaps, definitively the relationship humans have with plants, which also reinforces the theory that all life on earth is connected in many ways.